American Express is a relatively picky lender: most of the time they only extend credit to consumers or businesses with perfect credit history. But once you’re in with them, they offer you outstanding services. And last week, I made sure to take advantage of their generous credit policy for current card members. I requested a big credit limit increase. It is conventional wisdom on credit card forums that American Express will give you a 200% credit limit increase (an Amex 3X CLI) provided that you use the Amex card on a regular basis and have decent income. The first time you can request a credit limit increase (CLI) is 60 days after you get approved for the card. Then you can request a CLI every 6 months. 60 days into my card membership, I requested slightly more than a 3X CLI on the phone, and was counter-offered a 3X CLI which I accepted. My credit limit became $3,000. 7 months later, I decided to push harder to test the boundaries. But I insisted on a higher credit limit, so the representative transferred me to an Amex credit analyst. Very quickly, she made it clear to me that it was American Express policy to not grant more than a triple credit limit increase at a time. That made my effort to justify a higher credit limit increase futile. Spending, income, good credit history, etc., don’t matter – it is the bank policy. But she encouraged me to request another credit limit increase after 6 months. I surrendered. So what do we take from this story? Three important points to take note of. First, my experience is consistent with the Amex 3X CLI story. It reinforces the notion that a triple credit limit increase is Amex’s guideline. Second, 3X is also the limit on a credit limit increase. You can’t request more than a 200% increase at a time. Third, you can request a credit limit increase every 6 months. It is very generous of American Express to triple the credit limit – you will not find many other banks that are willing to give you that much more credit at once. I’m not talking about starting with a puny $500 and going up to $1.5k. This is going from $3k to $9k, both being significant limits for a credit card. So far, only Bank of America has topped that: they gave me a 6X CLI, from $2k to $12k. But after 6 months, maybe American Express will increase my credit limit to $25k then! I was really happy to see this 9 months ago. 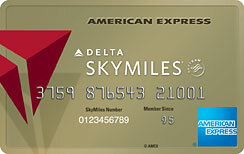 I was just approved for my Gold Delta Skymiles card with a starting limit of $5,000! I’m super excited! Good job Brandon! That’s an excellent starting limit with Amex! Have fun with the benefits the card offers! any disadvantage to having TOO much credit limits? If you are able to handle all credit cards you have, not really. If you apply for a mortgage loan in the future, the lender may ask you to close some cards if they feel that your total limit is too high. But until then, you have nothing to worry about. I just got approved today for a Amex Everyday Card but they only started me out with 3500.00 Do they still offer the 60 day increase? Congrats! Sure they do. Just focus your spending on the card and ask for a credit limit increase after 60 days. It’s a nice card. I received my delta card almost 60 days ago (1 week shy). Amex started me off with a $1000 credit limit. Upon receiving the card I immediately requested a CLI and it was denied. Others have said I should now wait 90 days before again requesting a CLI. What do you think? If I recall correctly, you have to wait for 90 days to request another credit limit increase if the previous request was denied. So what you’ve heard is correct.